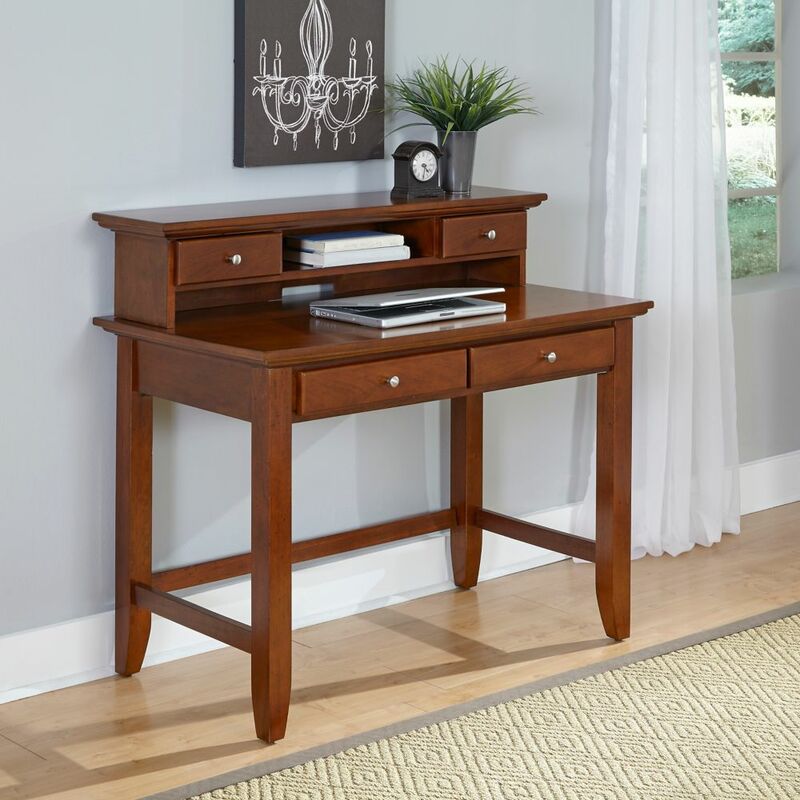 Designed in modern style and durability, this Home Styles writing desk is a perfect addition to any contemporary office. Its stylish brown finish brings a touch of flair to any room or office. Crafted from sturdy solid wood, it's sure to support your work space for years to come. Designed to keep you compact and organized, this desk is perfect for storing a computer and notebooks. Industrial meets rustic charm in this highly functional contemporary designed computer desk. Accented with strong black metal legs in a unique design, with plenty of storage that includes two side drawers with retro style metal pulls, and a wide middle drawer with a leather pull. The spacious tabletop constructed from high quality MDF material with a smooth laminate brown wood grain finish can easily hold your computer and other office essentials. This stylish computer/writing desk will be a standout whether you place it in a corner of your living room, family room, or home office space. The trendy and industrial look of this chic brown wood grain L shape desk upgrades your home office or workspace with functional storage and style. This spacious desk provides two work surfaces, which can conveniently be assembled on the left or right hand sides or even placed side by side. There is ample space for a computer or laptop, a place to write, read and spread out your documents. The desk also features abundant drawer storage, a hutch and 3 open shelves, including an adjustable bottom shelf keeping all of your essential supplies within easy reach. This desk storage unit is a must-have for any home office. Boasting a squared off overhang edge this desk is easy to clean and is outfitted with an attractive metal handle drawer to keep your documents and pens in the perfect place. Whether you homes style is mature and Transitional, urban and Contemporary, or cultured and Cosmopolitan, the Sierra Mission Desk is the perfect style statement for your dicor that is as attractive as it is affordable. Boost functionality to your home office with the Avalon Writing Desk. Its large surface area is ideal for the monitor and a pull-out keyboard tray disguised as a drawer. The unit also has two side drawers for extra storage of office supplies. Comes in a rich espresso finish with contemporary brushed nickel drawer pulls. Chesapeake 42-inch x 38.5-inch x 24-inch Standard Writing Desk in Brown Designed in modern style and durability, this Home Styles writing desk is a perfect addition to any contemporary office. Its stylish brown finish brings a touch of flair to any room or office. Crafted from sturdy solid wood, it's sure to support your work space for years to come. Designed to keep you compact and organized, this desk is perfect for storing a computer and notebooks.